Labo is Nintendo at its weird, wonderful best. The cardboard Variety Kit can turn your Nintendo Switch into a fishing pole, a motorcycle, a piano, and more fun toys. Again, this is cardboard! 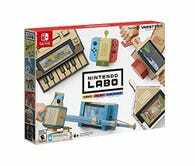 So if you have a Switch and you have a kid (that second part is optional, it’s okay to play with this yourself), $40 is a solid $30 discount on the Variety Kit, and the Robot Kit, which literally turns your Switch into a freakin’ mech suit, is also on sale for $40 (from the original $80).